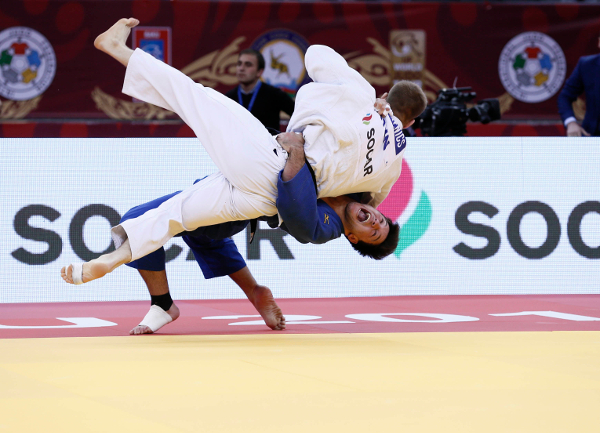 The Baku Grand Slam 2016 came to an intense conclusion on Sunday as the heavyweights produced their best ippon judo to sign off the final Grand Slam of the Rio 2016 Olympic qualification phase. 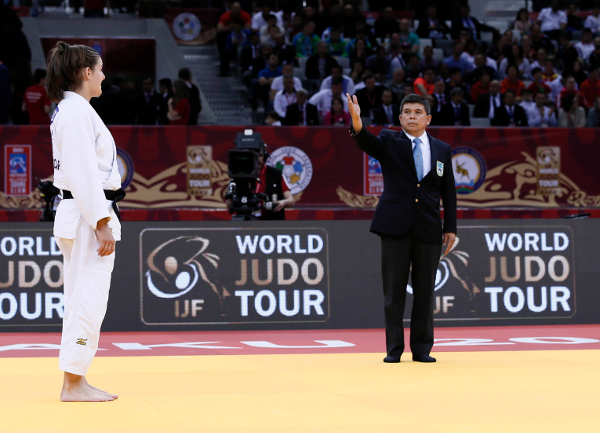 Azerbaijan’s final day of IJF World Judo Tour action saw 153 judoka (112 men, 41 women) compete for Grand Slam honours across the women’s -78kg and +78kg categories and the men’s -90kg, -100kg and +100kg categories. Japan finished top of medal table with three gold medals, one silver and two bronze medals as their eight-strong team all placed including world champions NAGASE Takanori (-81kg gold) and today UMEKI Mami (-78kg bronze). The Netherlands were almost ever-present in the final block on day three as they won all three of their medals on the final day including -78kg gold and silver and +100kg silver. The IJF World Judo Tour now heads for Kazakhstan as the Asian country will host the fifth Grand Prix of the season in Almaty from 13 – 15 May. Kazakhstan hosted the 2015 World Championships in Astana and now their annual Grand Prix moves from there to Almaty which also has a long and distinguished track record of hosting major events including the 2012 IJF World Judo Masters competition. The three-day competition in Kazakhstan is the final Grand Prix in the Rio 2016 Olympic qualification phase and will feature 517 judoka from 92 nations. The race to qualify for Rio 2016 will officially close with the World Judo Masters next month and now the stage is set for Almaty to present the most entertaining and dramatic Grand Prix of this Olympic cycle. European silver medallist Guusje STEENHUIS (NED) won -78kg title in Baku for the second year in a row with a determined showing on Sunday. The Dutch fighter was due to meet teammate Marhinde VERKERK (NED) in the -78kg final but the latter sustained a knee injury in her previous contest and was unable to go up against STEENHUIS. The victory is the third for STEENHUIS at a Grand Slam and now the -78kg standout will focus on the upcoming World Judo Masters. In the first semi-final STEENHUIS defeated world champion UMEKI Mami (JPN) in a bold display as the Dutch fighter looked past the red backpatch of Japanese and secured the right to fight in the -78kg final. STEENHUIS kept UMEKI at bay in regular time and was unable to trouble the scoreboard herself which led the contest into golden score and it was Rio 2016 pick UMEKI who was penalised and failed to reach the final. 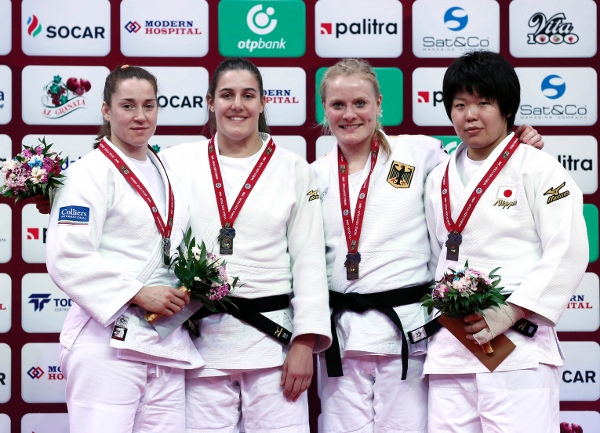 In the second semi-final European Championships bronze medallist Luise MALZAHN (GER) fell to Tbilisi Grand Prix winner VERKERK by a yuko score to guarantee gold and silver medals for the Netherlands. The first bronze medal was won by MALZAHN who fought off the challenge of Zagreb Grand Prix silver medallist Victoriia TURKS (UKR) to win the sixth Grand Slam medal of her career. MALZAHN registered a yuko which was the only score of the contest and was enough for bronze. The second bronze medal contest was won by UMEKI who trapped Olympic silver medallist Gemma GIBBONS (GBR) in osaekomi for 20 seconds with a sankaku-gatame for ippon. UMEKI is still only 21 and is gaining top level experience on the IJF World Judo Tour while GIBBONS has work to do to topple Natalie POWELL (GBR) in Britain’s battle for the -78kg berth in Brazil. Rio 2016-bound YAMABE Kanae (JPN) won +78kg glory as the Japanese fighter topped the field in the heaviest women’s category on Sunday. YAMABE was due to contest an all-Asian final against world champion YU Song (CHN) which would have been a fascinating duel but the Chinese fighter picked up a back injury in her semi-final and could not take her place in the final. World bronze medallist YAMABE, 25, who won the All Japan Championships in April to officially earn her selection for Rio 2016, is now a two-time Grand Slam gold medallist after achieving the same result in Paris in 2014. In the first semi-final YU defeated Emilie ANDEOL (FRA) in a scoreless contest by way of shido penalties. ANDEOL was penalised twice in the four minute contest while YU posted an unblemished record which was enough to claim a place in the final and the right to fight for the gold medal. In the second semi-final YAMABE saw off African Championships bronze medallist Nihel CHEIKH ROUHOU (TUN) by holding down the Tunisian for 15 seconds after leading by a waza-ari score. 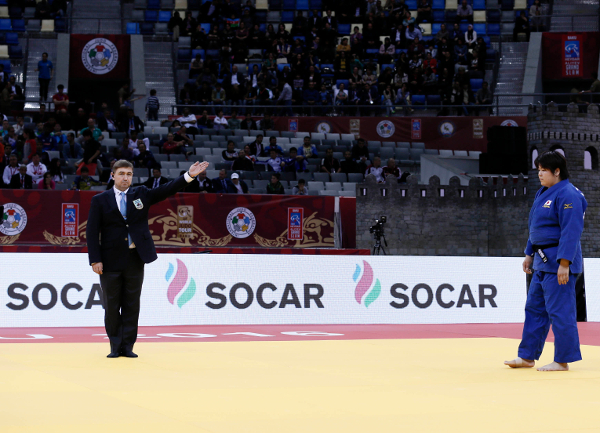 The first bronze medal was won by CHEIKH ROUHOU who wrapped up former Baku Grand Slam silver medallist Santa PAKENYTE (LTU) on the ground with a kami-shiho-gatame hold for 20 seconds. 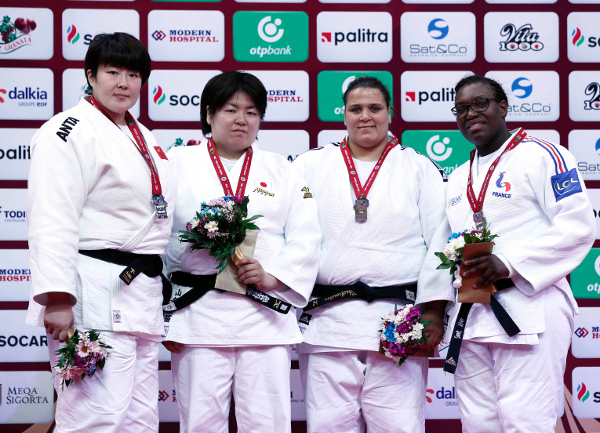 The second bronze medal was won by 2015 Paris Grand Slam winner ANDEOL who threw Tbilisi Grand Prix bronze medallist Maryna SLUTSKAYA (BLR) with an ouchi-gari for a yuko score and held on for the final place on the podium. European Championships bronze medallist Marcus NYMAN (SWE) continued his astounding upward trajectory as he won -90kg gold in Baku by beating Havana Grand Prix bronze medallist Aleksandar KUKOLJ (SRB) in the final. NYMAN added to his incredible 2016 haul of Dusseldorf Grand Prix gold, Samsun Grand Prix silver and continental bronze with four ippons in his five wins which included holding down KUKOLJ for the full 20 seconds for ippon. In the first semi-final four-time world medallist Kirill DENISOV (RUS) was shocked by KUKOLJ by a waza-ari score. The misfiring Russian could not threaten the scoreboard and had turn his attention to a potential bronze medal while in the second semi-final Jeju Grand Prix silver medallist Axel CLERGET (FRA) went down to NYMAN after being penalised on four occasions to receive hansoku-make. 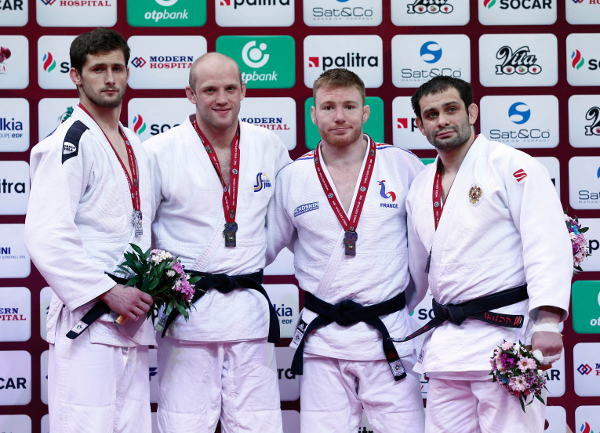 The first bronze medal was awarded to CLERGET who beat Samsun Grand Prix silver medallist Mammadali MEHDIYEV (AZE) to win the second Grand Slam medal of his career. CLERGET is a stylish fighter with an eye-catching repertoire of techniques and opened the scoring with a yoko-tomoe-nage for a yuko and went back to the same technique for a second yuko. The Frenchman almost got caught as the Azeri was now wary of the repetitive attacks and momentarily trapped CLERGET in osaekomi but he swiftly escaped and held on for the remaining seven seconds. The second bronze medal went to DENISOV who comprehensively beat Havana Grand Prix bronze medallist Ciril GROSSKLAUS (SUI) with a left-sided harai-makikomi for ippon. 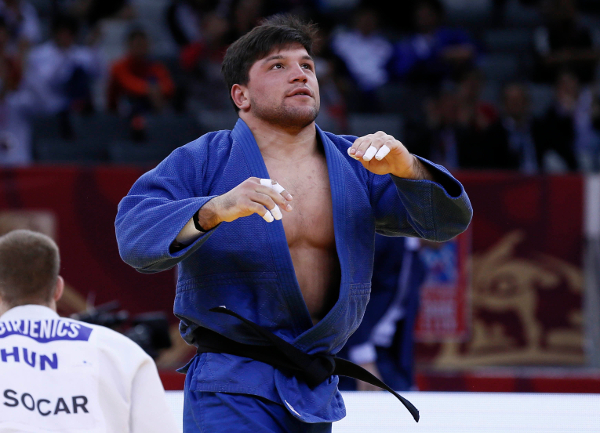 World Judo Masters winner Beka GVINIASHVILI (GEO) all but assured himself of a place at his first Olympic Games as the youngster and lightest judoka in the category in Baku won his first Grand Slam gold at -100kg against Samsun Grand Prix bronze medallist CIRJENICS Miklos (HUN). The 20-year-old Georgian saved his best until last as he won his sixth and final fight by launching CIRJENICS with a trademark ura-nage for ippon after 36 seconds which received a huge ovation from the Azerbaijan crowd. 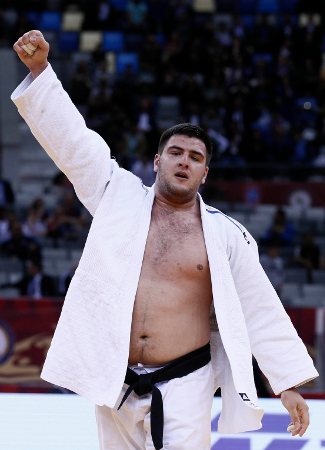 World number 25 GVINIASHVILI is now ready for an invite to the World Judo Masters and will be fancied to be in the medal hunt at the Olympic Games having only moved up from -90kg to -100kg in December. In the first semi-final CIRJENICS bested Dusseldorf Grand Prix bronze medallist and Rio 2016 hopeful Adlan BISULTANOV (RUS). The Hungarian came from a waza-ari down to defeat BISULTANOV after 75 seconds and put his own name into contention for the Olympics as he chases down qualification by right rather than a continental quota allocation. 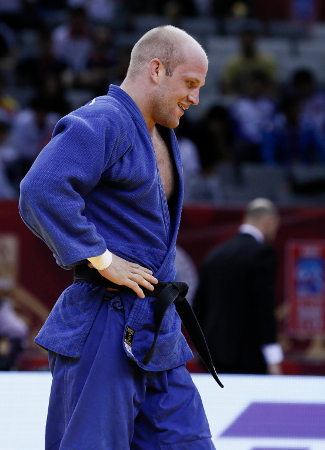 In the second semi-final GVINIASHVILI defeated Paris Grand Slam bronze medallist WOLF Aaron (JPN) with a ko-soto-gake earning a second waza-ari and guaranteeing his place on the podium. The first bronze medal was won by Tokai University member WOLF who emphatically sent Karl-Richard FREY (GER) over with a sublime uchi-mata which Japanese head coach INOUE Kosei would have been proud of. The second bronze medal was won by number two seed Dimitri PETERS (GER) who bested 2015 Baku Grand Slam winner BISULTANOV. After seeing teammate FREY finish fifth in the previous contest, there was added incentive for PETERS who threw BISULTANOV with an osoto-gari for a yuko and that was the only score after five minutes. 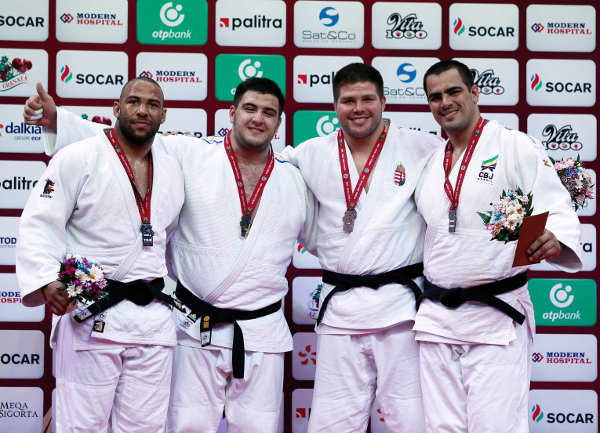 The result hands all the momentum to ne-waza master PETERS with one qualification event remaining as both judoka will be invited to the World Judo Masters in Mexico. World bronze medallist Iakiv KHAMMO (UKR) is counting down the days to Rio and expected challenge for an Olympic medal after another fine win on the IJF World Judo Tour. 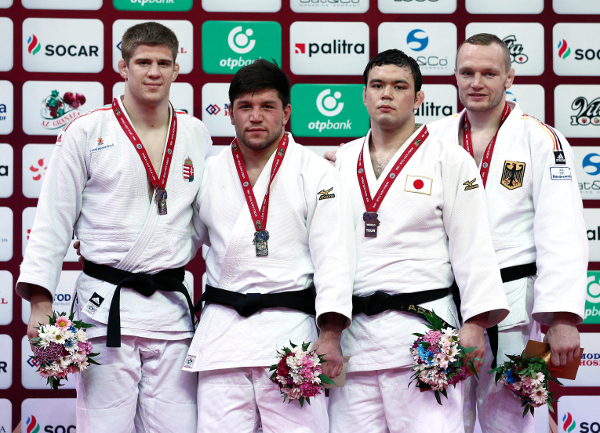 The 21-year-old Dusseldorf Grand Prix winner beat Tbilisi Grand Prix silver medallist Roy MEYER (NED) in the +100kg final as he shut down the powerhouse Dutchman for the five minutes of regular time and golden score. KHAMMO pressed forward and threw with a sasae-tsurikomi-ashi after 69 seconds of additional time for a match-winning waza-ari score as MEYER had no energy left to defend the attack. In the first semi-final home Olympic hope David MOURA (BRA) was well beaten by KHAMMO who scored a yuko with an osoto-gari and a waza-ari from a beautiful drop seoi-nage to add to his opening waza-ari. In the second semi-final MEYER outworked 35-year-old Asian Championships silver medallist Abdullo TANGRIEV (UZB) who received hansoku-make for four shidos. In the first bronze medal contest BOR Barna (HUN) was awarded the contest and medal after TANGRIEV could not fight due to an injury. The first bronze medal went to MOURA who had the measure of BATTULGA Temuulen (MGL) as the superior conditioning of the Brazilian gave him the platform to attack with vigour and saw him throw with a stunning beautiful seoi-nage for a yuko which left the crowd purring.